Other experts dismiss this so-called “purism.” Language is dynamic, after all, and rules change as our society evolves. Diyaryo is now dyaryo, and that should be fine. Departamento should be okay too, just as correct as Kagawaran. Conversations about these distinctions are important because they encourage us to raise questions and seek answers about the influences that affect our culture. English, for example, has been so pervasive that most writers employ its grammar and syntax rules when writing in Filipino. We often use “sa pagitan ng” to translate the word “between” even when a simple “ng” can suffice (e.g. kasunduan sa pagitan ng Pilipinas at Tsina). We also use “kung saan” in place of “where,” even when we’re not referring to a place (e.g. matatagpuan ang ebidensya sa dokumento kung saan…). Learning and investigating these linguistic nuances are, to me, the reasons why Filipino and panitikan should remain mandatory in Philippine tertiary education. The debate goes beyond stirring some token patriotism. Knowing when to use the right Filipino word is one thing, but we should also learn the value of appreciating the diversity of our own language and of understanding why we speak and why we write a certain way. The rules we can learn in high school, sure, but the practice of critical thinking? I doubt it. In his book Pedagogy of the Oppressed, educator and philosopher Paulo Freire likens the standard education system to banking. According to Freire’s metaphor, teachers are the depositors of knowledge and “the [students are limited to] receiving, filing, and storing the deposits.” We simply parrot whatever DepEd decides to teach us, but at some point we must also learn how to question the rules and to understand why they’re there to begin with. “Knowledge emerges only through invention and re-invention, through restless, impatient, continuing, hopeful inquiry,” writes Freire. And in the context of our language, nobody will enrich this knowledge for Filipinos but Filipinos themselves. Still, I write this post in English. Fluency in English makes you more globally competitive, apparently. And per our skewed standards, English also makes you sound smarter and more worthy of undivided attention. “It’s absoluuuutely ridiculous,” says the Tinio poem. Read it. It’s a damn beautiful diss track. Ver-gi-di-ma-rium by Marston ba or Hall? para maevalyuweyt kung Madame Ovaltine was landi o saint? And what kind of iskolarsip daw na putangna? Abá’y talagang anak ng garapata ng áso ni San Roque! ladya kami sa istetsayd na dunong-dunungan. The poem was grabbed from Meredith Ramirez Talusan’s post in Stanford University’s Arcade. 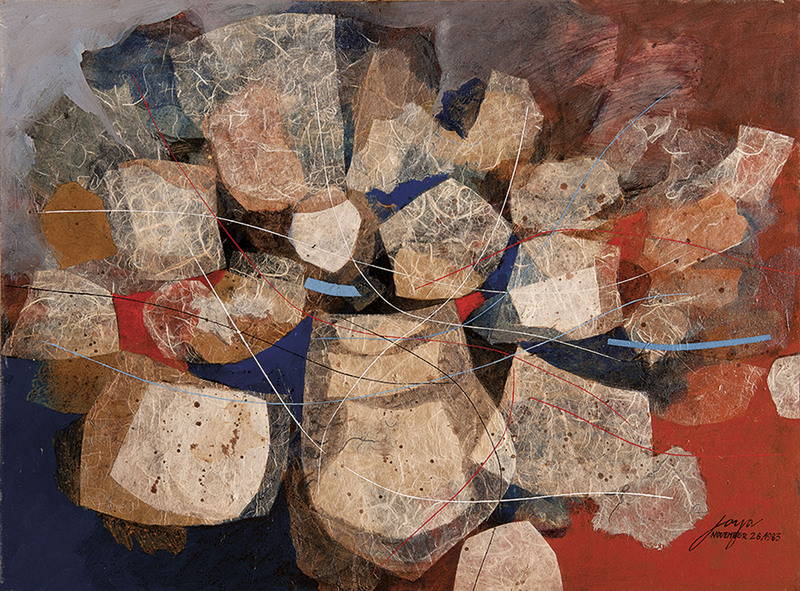 The featured image is Jose T. Joya’s East Meets West grabbed from the auction site Christie’s. Siyokoy not syokoy? Now I learned something. Technically, Doc, ‘yan ang tama. Pero depende pa rin po kung prescriptivist o descriptivist kayo o ang kausap ninyo. Para kasi sa ilan, dahil widely used naman na ang “syokoy,” tama na rin ito hehe.